Beta – The return generated from a portfolio that can be attributed to overall market returns. Exposure to beta is equivalent to exposure to systematic risk (see below). The alpha is the portion of a portfolio’s return that cannot be attributed to market returns, and is thus independent from market returns. Alpha – The return generated based off of idiosyncratic risk (see below). Systematic Risk – The risk that comes from investing in any security within the market. The level of systematic risk that an individual security possesses depends on how correlated it is with the overall market. This is quantitatively represented by beta exposure. Idiosyncratic Risk – The risk that comes from investing in a single security (or investment class). The level of idiosyncratic risk an individual security possesses is greatly dependent on its own unique characteristics. This is quantitatively represented by alpha exposure. (Note: A single alpha position has its own idiosyncratic risk. When a portfolio contains more than one alpha position, the portfolio will then reflect each alpha position’s idiosyncratic risk collectively. Alpha and beta expose portfolios to idiosyncratic risk and systematic risk, respectively; however, this is not necessarily a negative thing. The degree of risk to which an investor is exposed is correlated to the degree of potential return that can be expected. Core/satellite investing is a method of portfolio construction designed to minimize costs, tax liability and volatility while providing an opportunity to outperform the broad capital market as a whole. The core of the portfolio consists of passive investments that track major market indexes, such as the Standard and Poor’s 500 Index (S&P 500) and/or the Barclays Capital Aggregate Bond Index. Additional positions, known as satellites, are added to the portfolio in the form of actively managed investments. 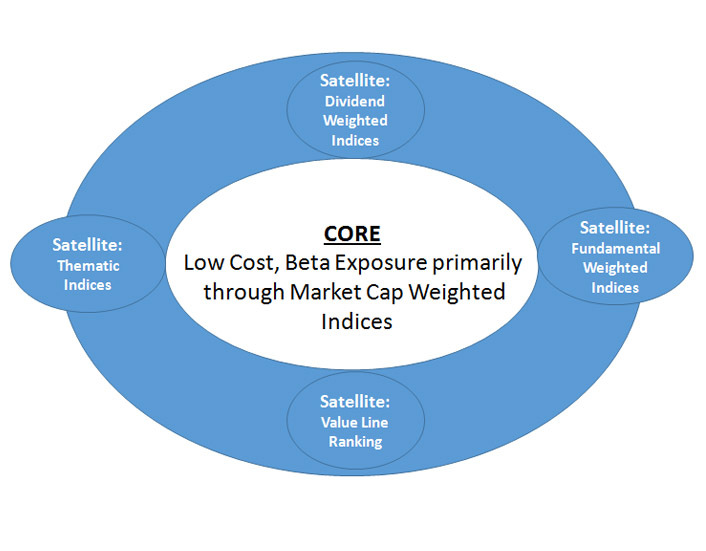 The conventional view of the core-satellite methodology suggests it is prudent to use index funds for markets that are deemed efficient and to use active managers in areas considered to be inefficient, where the managers are presumed more likely to succeed. Strategic asset allocation calls for setting target allocations and then periodically rebalancing the portfolio back to those targets as investment returns skew the original allocation percentages. The concept is akin to a “buy and hold” strategy, rather than an active trading approach. Of course, the strategic asset allocation targets may change over time as the client’s goals and needs change and as the time horizon for major events such as retirement and college funding grow shorter. Tactical asset allocation allows for a range of percentages in each asset class (such as Stocks = 40-50%). These are minimum and maximum acceptable percentages that permit the investor to take advantage of market conditions within these parameters. Thus, a minor form of market timing is possible, since the investor can move to the higher end of the range when stocks are expected to do better and to the lower end when the economic outlook is bleak.